I have a major paper due tomorrow and I haven't started working on it, so naturally I'm blogging. Keeping up with a well established tradition, lol. And I think I'll be making it a tradition to do some canning in the summer and fall. I love it! It's really satisfying to put stuff in jars and have it sit on a shelf looking pretty, and then opening it much much later and having it still taste good! I've been bitten by the canning bug. This season, I bought the kit from Ball that has the wide mouth funnel and the extra large jar tongs, and the magnetic wand to pick lids up out of the hot water. 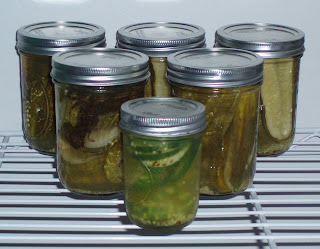 It was SOOO much easier to do these pickles than it was to do the assorted butters last fall. I'm looking forward to getting my hands on a large bag of tomatoes to make salsa and put that up. My only disappointment regarding the pickles...for some reason I thought I would be able to eat them after a few days. I've got to wait 4-6 weeks! I would have started them two weeks ago if I'd know that. Alex started school at the Providence Center today and had a great time. I didn't have as great of a time, because I was at PT working my legs off. On a side note, I've been doing lots of leg lifts which I think might be working my abs as an bonus consequence. I'll take it! I graduated today from 1.5lb leg weights, to actual 3lb leg weights (woohoo!). It sound pathetic, but it means that I'm getting stronger, which means that I'm closer to my goal. I rode the bike for 10 minutes today and my knee only popped for the first minute or so, and then stopped. That's progress. Once we get over the popping, I can start running again. Yay progress! Speaking of progress, I'm almost finished with my last mitten for Cascade and the testers are starting to report in. I'm really pleased with this one. Oh, and I'm getting ready to order my yarn for the SSS2011 socks. That's my next project. Then there's Alex's sweater, and then I have a shawl to knit for a bridal party before the end of October. Not exactly sure when I'll get Aaron's birthday blanket finished, but it sure won't be before his birthday, lol. Well at least we have the yarn, and I did buy him a gym membership so I think I'm covered. Thanks for visiting my blog! i love all your knits! I can only knit scarves lol i've never tried canning, but i sure do love pickles lol.